bmpanel2.py – A future bmpanel2 python library, there will be basic functions for parsing config/theme format and interacting with bmpanel2 through the python script. 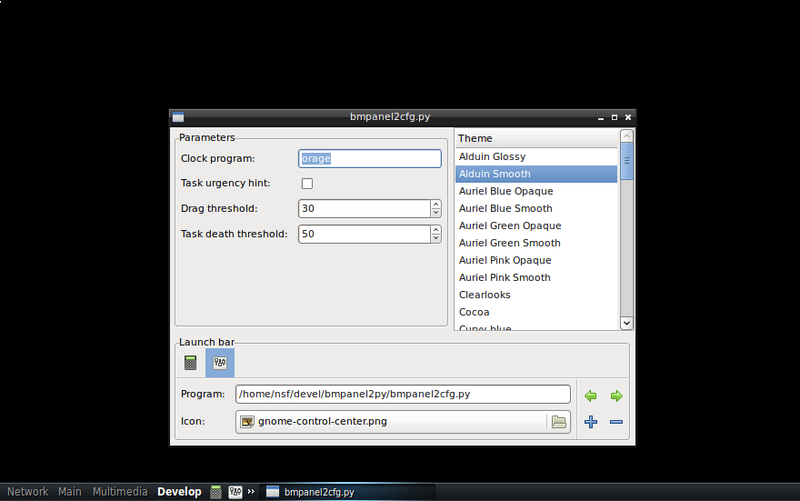 bmpanel2cfg – A PyGTK python script, the config tool itself, uses bmpanel2.py module. setup.py – Draft version of the python distutils script. Installs both the module and the executable. You can try out this tool using the script directly (./bmpanel2cfg) or install it first using the standard way (python setup.py install) and then just run directly (bmpanel2cfg). There are few caveats however, for example script currently will work only with single instance of bmpanel2 and there are still no support for multiple launch bars (support for this also lacks in the panel, so it makes sense). Anyway, just try it out and say what you think. Bug reports -> here <-. All changes in the tool are immediately reflected on the panel. And as far as I’ve tested it, this amount of reconfigure signals doesn’t burst the CPU up, so it should be really nice addition to the panel. I’ll try to upload it in few days, keep watching blog for updates.